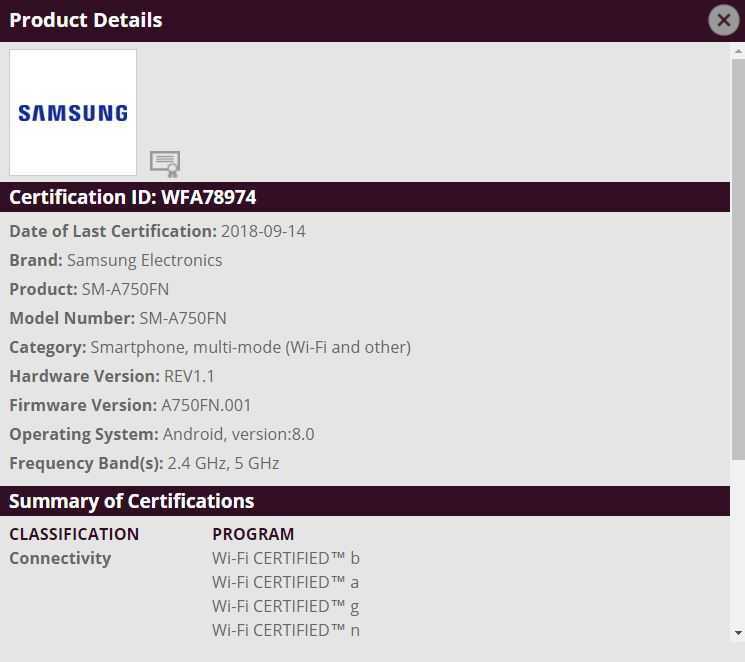 Samsung Galaxy A7 (2018), the upcoming A-series smartphone from the company has been spotted at National Communications Commission (NCC) in Taiwan along with FCC and Wi-Fi Alliance Certification website. The handset has a model number of SM-A750GN/DS whereas DS stands for its dual-SIM version. The same model had bagged approval from Federal Communications Commission (FCC) in the U.S. earlier in this month. Also, the handset has been certified by Bluetooth SIG body. Apart from the SM-A750GN/DS model number, its NCC listing has not revealed any information on its specs. The Bluetooth SIG certification has approved SM-A750FN and SM-A750N models through which it has been revealed that these models carry support for Bluetooth 5.0. The FCC listing of the phone has only confirmed that the handset will carry support for GSM, WCDMA, LTE, Bluetooth ANT+, NFC and GPS. The same device has also bagged Wi-Fi Alliance certification today. None of the aforementioned authorities have revealed the detailed specs of the Samsung Galaxy A7 (2018). It is speculated that the handset will be sporting an 18.5:9 aspect ratio Infinity Display design like the Galaxy A6+ and Galaxy A8+ smartphones. The handset was recently spotted on Geekbench with specs like Exynos 7885, 4 GB RAM and Android 8.1 Oreo OS. Also, the Galaxy A7 (2018) is likely to come equipped with dual rear cameras and an IP rated water and dust resistant chassis. There is no information on the launch date of the phone. The Galaxy A8 and Galaxy A8+ were made official in December 2017. Hence, there is a possibility that the Galaxy A7 is likely to get announced by the end of this year.